My mother-in-law was visiting us from Colorado and was excited about visiting Joshua tree National Park. I knew it was famous and attracted millions of visitors each year, but to be honest I thought it was mostly an area for rock climbers, with a bunch of Joshua Trees to drive by and see. After a quick stop at the visitor center in Oasis of Mara, we did what I like to call “drive-through tourism”. You know, it’s where you drive the car slowly, maybe 10 mph, with your head out the window like a family dog, only stopping long enough to snap a few pictures to prove you were actually there. In less than two hours we left the park and made our way home, feeling a little disappointed in the park and for a good reason. In our haste we actually missed the park, because apparently you need to actually get out of your car and explore the area to really appreciate it. After we returned home, my wife, the brilliant one of the group, opened the tourist guide that I got from the visitor center and read it. She is usually a kind and gentle person, but she loves to be the tourist, taking the time to really see and enjoy the places we visit. When she realized that we actually missed the park, she decided to take the next two hours and show me all she had learned about it, standing behind me with her hand firmly on my shoulder while I sat in front of the computer reading all there is to know. 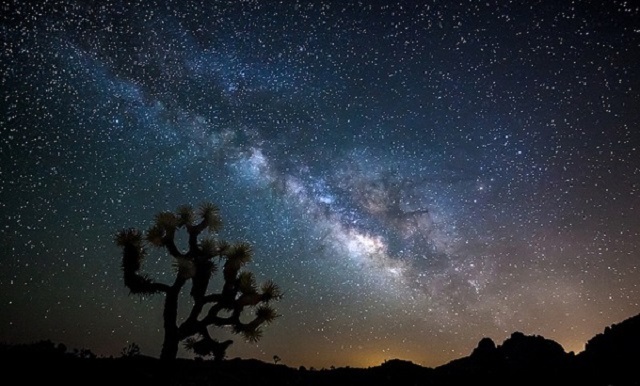 Regardless of hot weather and rugged climate, millions of visitors arrive at Joshua Tree National Park each year. 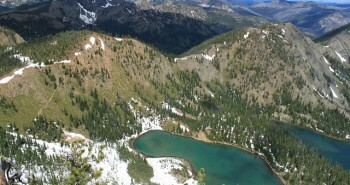 Many also consider it to be one of the last great wilderness areas of the continental United States. Nearly three-quarters of the 794, 000 acres is wilderness and the point where two deserts converge: The Colorado Desert is on the eastern side, and the Mojave Desert on the western side and also boasts the famed Joshua Trees. The Colorado and the Mojave Deserts have no distinct boundaries to distinguish these two apart. Although the transition zone is where the wildlife of both desert ecosystems live, including bighorn sheep, chuckwalls, cactus wrens, Gambel’s Quail, road runners, desert tortoises and desert iguanas. 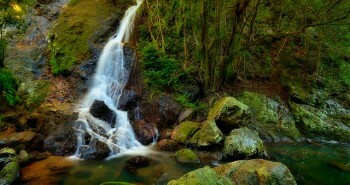 The Park is a great place for hiking enthusiasts, with various trails for different levels. Forty-nine Palms Oasis is a moderately strenuous, 3-mile route. Along the way, take a moment to admire the Jumbo Rocks, which formed as a result of underground volcanic magma eruption. These molten rocks rose from the earth and formed overlying rocks as they cooled at the surface. 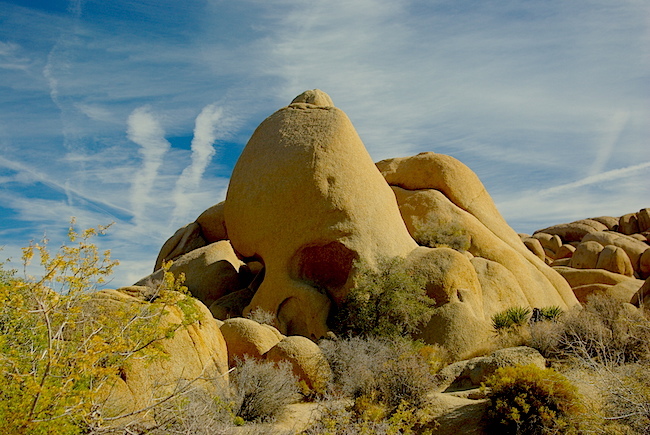 Water and wind erosion transformed them into different shapes, some of which resemble human faces and bodies. 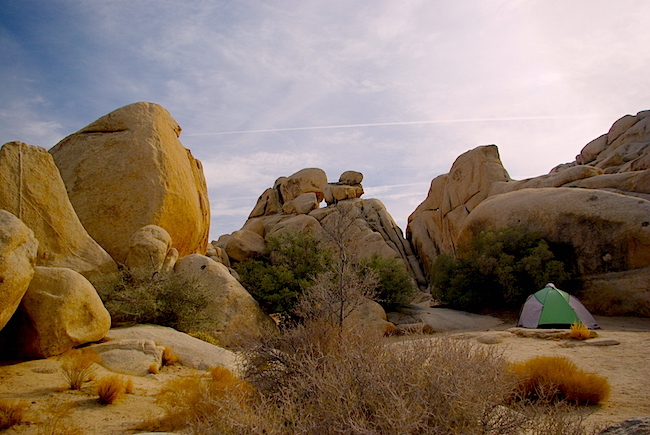 Then head to Key Ranch to learn about Bill and Frances Key’s story, who were the successful homesteaders in Joshua Tree. This might be a great place to get out and take a little walk, or have a picnic lunch and read the literature the visitors center provides. Built in 1900 to hold water for mining and cattle use, Baker’s Dam is a small, rain-fed reservoir for the wildlife to use. It’s a great place to get out of your car and go for a walk on the slightly difficult, 1-mile trail loop. 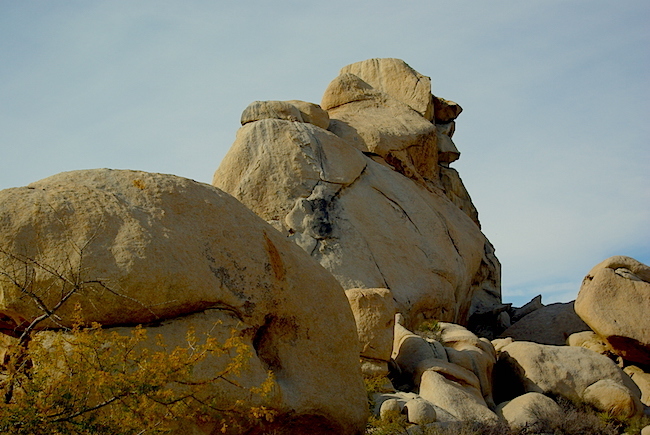 Hidden Valley is the most sought-after and picturesque area of the park, with huge boulders for rock climbing and a one-mile trail through the legendary cattle rustler’s hideout. 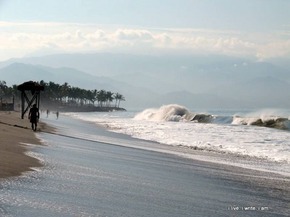 The hike is worthwhile, and it’s also wheelchair and stroller-friendly. The rock formations are amazing, and the site is almost always full of campers ready to share their exciting stories of rock climbing with anyone strolling by. From here, follow the signs towards Key’s View. At approximately 5185 ft. in elevation, the scenery is breathtaking, with mountains, valleys and deserts converging below. Look closely to see the San Andreas fault line. 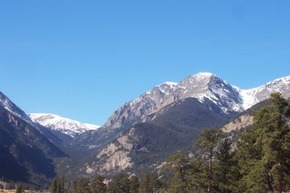 Ryan Mountain is a 3-mile trail that provides hikers with views of Queen, Lost Horse and Pleasant Valleys. Lost Horse Mine is a 4-mile, round-trip trail that leads to the 10 Stamp Mill and Mine site, which was the gold mining area in the past. The Geology Tour Road winds its way through the fascinating geological sites of the park. 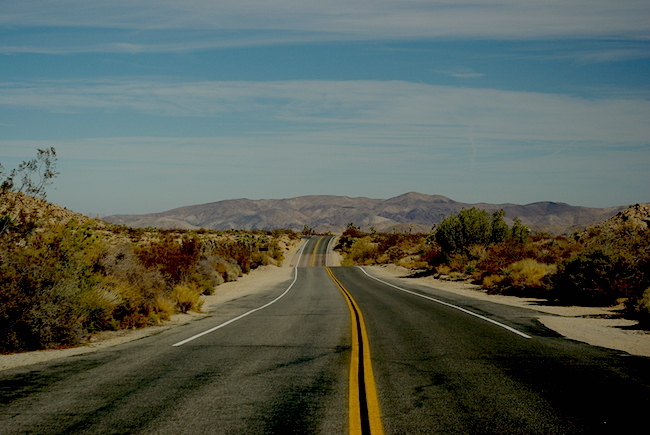 This is an 18-mile drive on Berdoo Canyon Road to the town of Indio, bypassing the Cholla Cactus Garden and Cottonwood Spring, which the Cahuilla Indians used as a water source for centuries. As if brushed with a rainbow of colors, the landscape brims with wildflowers in spring and early summer. The Joshua Tree itself has cream-colored blossoms. Bright, twinkling stars blanket the night sky, and you may even be lucky to wish upon a few shooting stars. The park is famous for this popular sport, especially in Hidden Valley. It’s interesting to stop and watch many climbers preparing to climb or see others celebrating at the top. Trails are all over the park, and many are stroller and wheelchair-friendly. Although most campgrounds have picnic areas, with tables, toilets and fire pits, they don’t provide portable water—after all, it’s the desert. Nights in the desert are cold, so bring some warm clothes even if it’s a hot summer day. Words alone can’t describe the contrast of the silhouettes of Joshua Trees and rock formations under a blazing orange sky—it’s simply mesmerizing. After spending those couple hours learning about Joshua National Park, I realized that we really didn’t see the park at all. There are many parks that you can see from your car, but this park isn’t one of them. Even though I consider myself a pretty seasoned tourist, this experience taught me how important it is to take time to research where I’m going and properly plan my visit. I used to kind of mock my wife when she did this, but now I appreciate her efforts. I’m excited to visit this park for the first time. 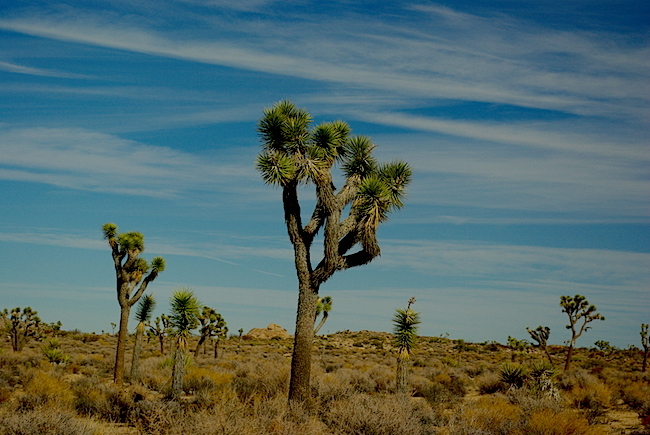 Joshua Tree is an incredible place, happy memories from there! so is your wife making you go back to see the rest of the park?? ? my daughter would love to visit because she loves rock climbing. What do you think Tamara? 🙂 She made us not only go back to Joshua Tree but to Big Bear, Calif. I promise I would listen to her next time and not do “drive through tourism”. 🙂 The hidden valley is a great place for rock climbing. We had so much fun on the 2nd trip. Gorgeous photos! I love this park.